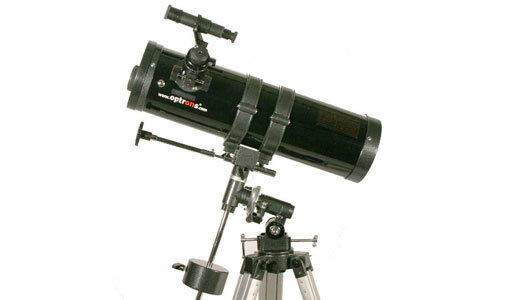 The Optrons 150/1400 Newtonian reflector is an example of a cheap Chinese telescope purchased from an auction site. Effectively it's a 700 mm tube with a 2X Barlow lens built into the focuser. Compared to the sky watcher EQ1 Mount, this example is particularly flimsy. However, after rebuilding the telescope and with proper collimation, it has now become a passable scope. However, some may find this type of 'device' off putting form the outset and requires a degree of understanding in order to get it to perform adequately, so as a beginners telescope it misses the point. Compared to the Explorer 150, it gives one an idea of the difference in quality and usability, which is why we added it to our fleet.